Getting up early to train and workout at 6am may not be to everyone’s taste, but StrengthBox trainee Jill has been doing just that since late 2010. In fact, she’s just logged her 500th visit! I’m so proud of her accomplishments. She sent me an unsolicited letter today, stating “I felt compelled to write something after a conversation with my kid”. A lightbulb went on. First, I was surprised that my teenager is paying attention. Second, she was right! But I’d never really connected the dots. I hit the half-century mark a few years ago and, like many others, started to think about how I wanted to live the second half. I resolved to “just do it,” which has so far led to two volunteer trips to East Africa; learning to speak basic Swahili; ongoing volunteer work closer to home; rediscovering ocean kayaking and back country camping (my husband and I fulfilling a long-time dream to buy our own kayaks); and finding out that I actually enjoy cooking, thanks to some paleo-style recipe books. I also strive to be the mom my two kids need, while staying on top of a challenging and rewarding full-time job. StrengthBox was simply another item on my “just do it” list. It hadn’t dawned on me that my early morning workouts (you rock, 6 a.m. class! ), along with Greg’s dietary advice — daily doses of high quality fish oil and sea vegetables, for example — are the engine that powers everything else. StrengthBox has given me more confidence, strength and energy than I’ve ever had. I never imagined I’d be doing pull-ups (albeit with the help of a rubber band or two), flipping giant tractor tires, climbing walls or doing crab walks and bear crawls at this age. I’m doing things now that I couldn’t do when I was much younger — I always hated those monkey bars. StrengthBox is my playground. And apparently my kids are paying attention. 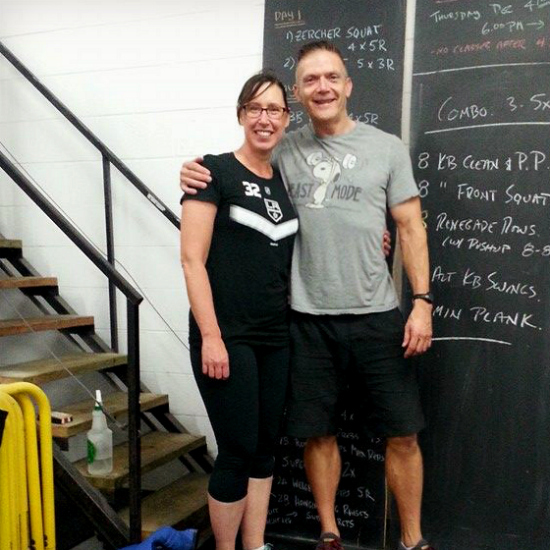 Thanks for the kind words and StrengthBox testimonial Jill. We look forward to seeing some more great results from you this year! If you’re in the Toronto area and are interesting in increasing your own strength, energy and vitality, why not book an intro session at the StrengthBox for yourself?